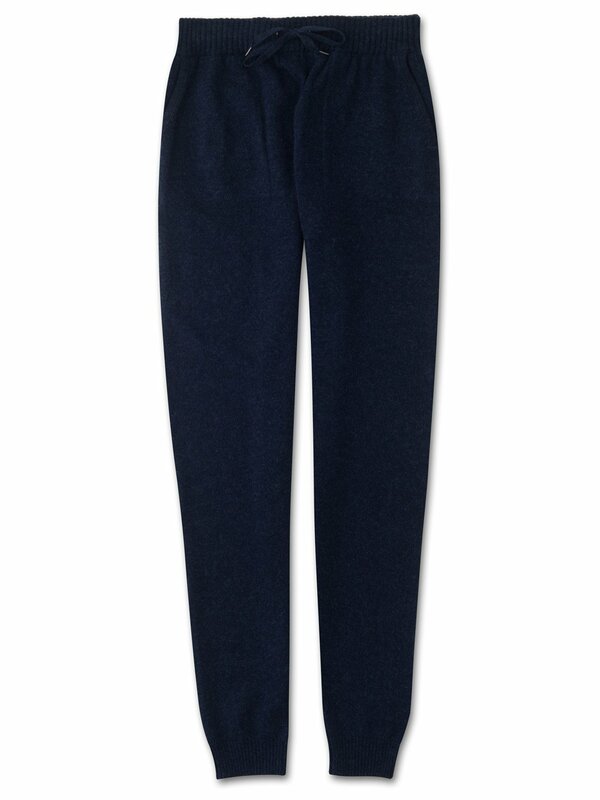 Our Finley midnight blue women's cashmere track pants have a gradual taper to the leg and ribbed ankle cuffs for a great fit that works for both lounging at home and off-duty weekend attire. With their elasticated waist, drawstring tie, angled front pockets and back pocket, the aim was to create a garment which looks effortlessly chic but is still as comfortable to slip into as a favourite tracksuit. Lightweight and easy to fold and pack into your luggage, these track pants also make for the perfect off-piste ski attire. The Finley track pant is part of our premium line of luxury contemporary leisurewear, born out of the desire to craft an off-duty wardrobe that matches up to the highest sartorial and quality standards. Our philosophy is to use the finest materials and components, paying attention to every detail of construction, so that the resulting garment is both comfortable and stylish. Seen here in a midnight blue, this has to be the finest way to stay warm during the colder months.